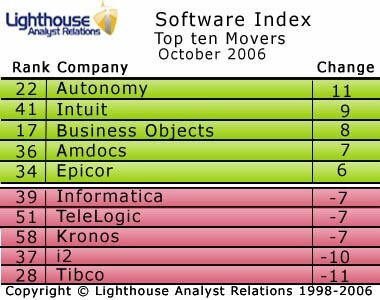 In the top ten of this month’s Software Index, Symantec trades places with Novell but otherwise there is no change. Far more interestingly, Autonomy is the joint highest climber moving up 11 places to number 22. Intuit has also moved up 11 places but it started from a lower position and is presently ranked at number 37. Business Objects enters the top flight this month with a terrific rise of eight places and is now ranked at a very respectable 17th position. There is bad news for Tibco. It has produced its worst performance in the Software Index so far this year, plunging 11 spots and out of the top 25. It is closely followed by i2, which fell ten places.